The newborn baby western lowland gorilla clutches its mother. The yet-to-be-named newborn can be seen now at The Philadelphia Zoo. The Philadelphia Zoo is using the publicity of its newborn gorilla to help the lives of primates a continent away. Zoo officials announced Tuesday that the new western lowland gorilla is a girl and welcomed the public to participate in a naming contest. The gorilla was born on Aug. 26 to a 21-year-old female named Honi and 31-year-old male named Motuba. Social media users immediately squealed in delight at the notion of naming the gorilla after Harambe, a gorilla killed in May after a child entered its enclosure in the Cincinnati Zoo. However, a zoo spokesperson quickly shut down that idea. Instead, the zoo is refocusing that enthusiasm into an effort to benefit gorillas orphaned by poaching in Africa. The contest will benefit gorillas at the Gorilla Rehabilitation and Conservation Education Center (GRACE), located in the Democratic Republic of Congo. 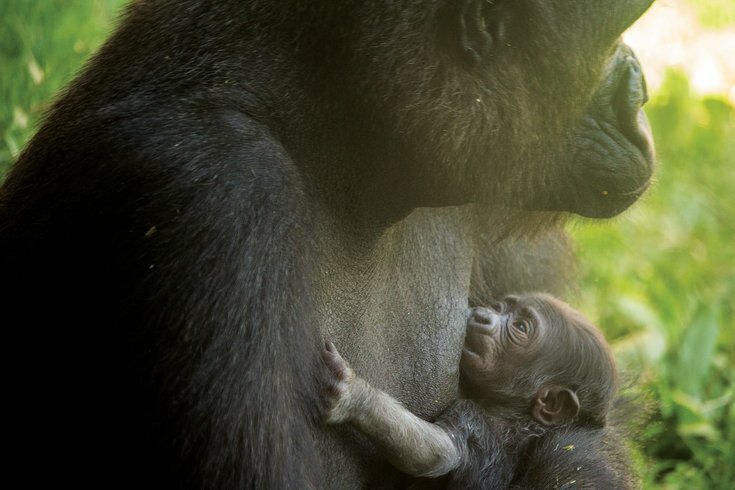 “We hope that naming Honi’s new baby after an orphaned gorilla at GRACE, and inviting our global community to select the name, will help make a connection and engage many in the efforts to save gorillas and other wildlife,” said Kim Lengel, Philadelphia Zoo’s VP for Conservation and Education. Voters are able to choose from four names chosen by Philly Zoo staff. Users have unlimited votes in the donate-to-vote contest that launched Tuesday. Each dollar donated counts as one vote. The Philly Zoo will also match the donations up to $10,000. The options are Amani (“ah-MAH-nee”), Isangi (“eee-SANG-ghee”), Mapendo (“ma-PEN-doh”) and Muyisa (“moo-YEE-sah”). Voters will also be entered to win a Philly Zoo prize package, which includes a family plus membership, a behind-the-scenes experience, a $25 food voucher and a $25 zoo shop gift certificate. To vote, visit the Philadelphia Zoo's website here.